The Rotak 34R is packed full of incredible features to ensure you get a pristine lawn every time. The mower has a high speed 1300W Bosch ‘Powerdrive’ motor that enabling you to cut long grass with ease, helping trim that start-of-season growth. Featuring grass combs, this lawnmower is able to easily cut up to or over the edge of your lawn giving a more thorough cut. It has a full 34 cm cutting width, ideal for medium sized lawns and offers a range of adjustable cutting heights. 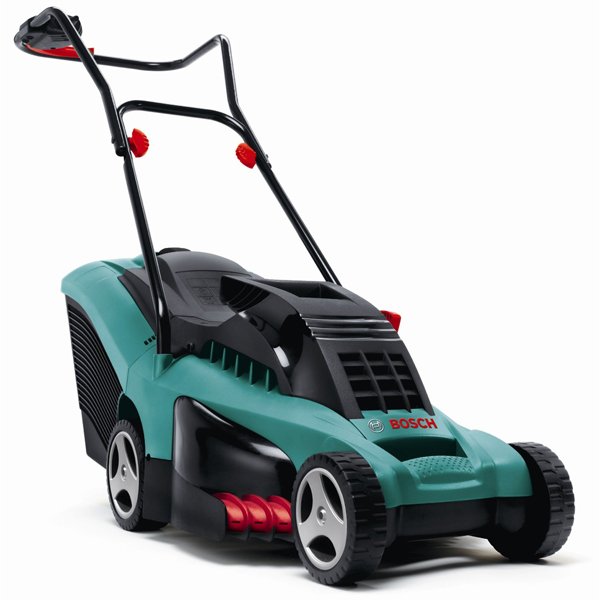 One of the lightest and fastest mowers of the Bosch Rotak range. The high speed 1300W motor and gear set work together to keep the blade running at a high rpm by altering the torque supplied by the motor. When the going gets tough, the system senses the increased load on the blade and increases the torque to the motor. This means Full Power!